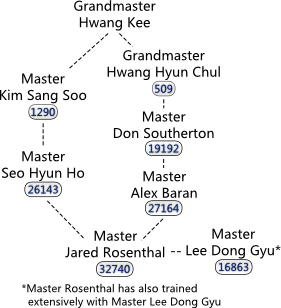 Master Jared Rosenthal (Sa Bom Nim) has been training in the art of Soo Bahk Do (Tang Soo Do) since the age of seven years old. Master Rosenthal continues to attend Regional, National and International events to further his personal growth and for the development of Oregon Moo Duk Kwan. Carly Burris began her Soo Bahk Do (Tang Soo Do) training as a young child in Mount Vernon, Washington and earned her 1st Dan at the age of fifteen. In 2012, after a twenty-year break, she resumed her training. She moved to Oregon and joined OMDK in 2013 and has been a dedicated practitioner and leader ever since. In 2015, she earned her Kyo Sa (International Instructor Certification) and is an active participant in both regional and national events.